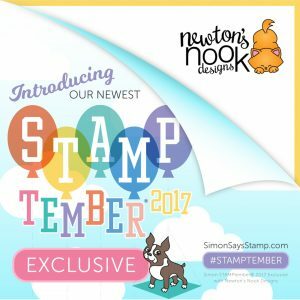 We are in the middle of the Newton’s Nook Designs release week so what better time to share the newest STAMPtember set from Simon Says Stamp?!! Yes, today we celebrate the collaboration with Simon Says Stamp and Newton’s Nook Designs so you have to know how happy that makes me! 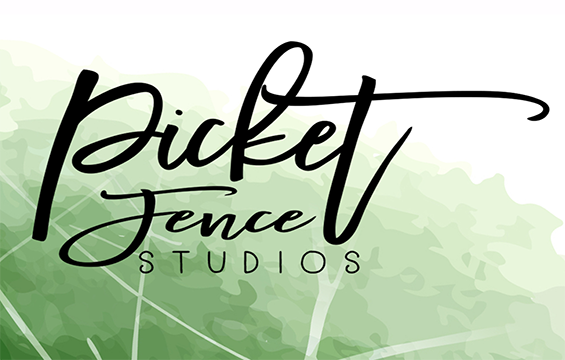 Two fabulous companies! 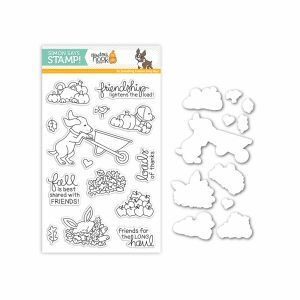 This sweet stamp set comes with our little dog friend pushing a wheel barrow and LOTS of options for filling it. I thought it would be fun to add in the bunny and leaves, which gave me the perfect excuse to use the new Falling Leaves Stencil that NND revealed yesterday (and available on Friday, Sept. 15th). I stamped the bunny and then masked to add the wheelbarrow in a way that makes the leaves kind of spill over. Isn’t it cute?! Then, using my Chameleon Pens and Color Tops, I colored the images. I love how I can get a real fall leaf feel with the shading from these Color Tops! I wanted the focus to stay on the image but the embossing paste with the stencil adds just the right amount of interest behind our little friends. Gotta say, these are a perfect go-together. 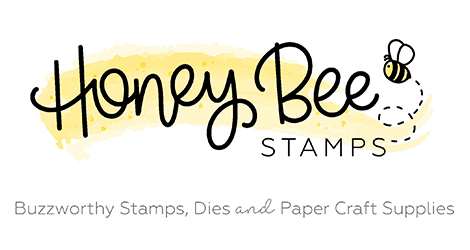 Remember, this STAMPtember release is only available directly from Simon Says Stamp (and conveniently enough, they will have the new stencil a SSS on Friday once it goes “live”). If all that wasn’t enough, there is a matching die set for the images too. Good luck holding onto your paycheck! STAMPtember is fun time of year but oh so dangerous for the budget! 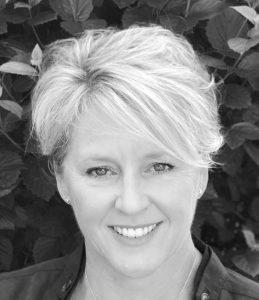 *smile* Thanks for stopping in to see my take on the new release. Make sure you go over to the Simon blog to see all the inspiration there. See you back in a little while for Day 2 of the NND September release.